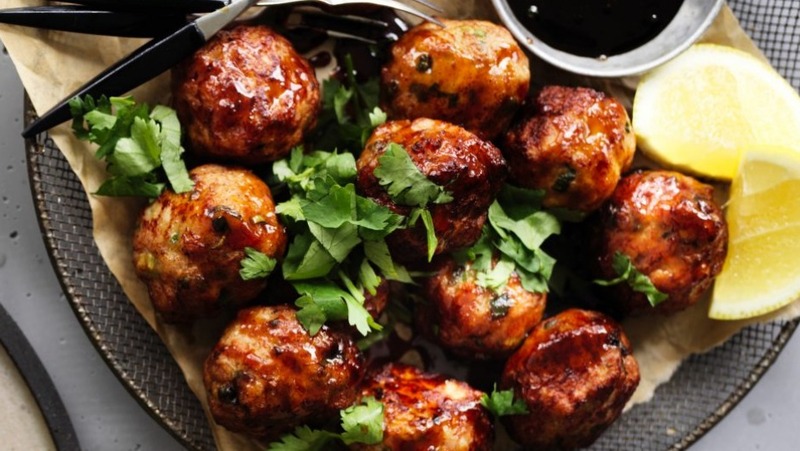 These meatballs make the perfect starter or main for a fresh, zesty Asian inspired meal. 1. For the sauce, place all the sauce ingredients in a bowl and whisk together. 2. To make the meatballs, place the chicken, spring onion and ginger in another large bowl and combine until smooth and completely incorporated. Add soy sauce, mirin, sesame oil, egg and cornflour and mix well, adding extra cornflour if needed – the mixture is meant to be quite soft. With moistened hands, roll it into small balls about 4cm in diameter. 3. Pour the vegetable oil into a frying pan until it comes 2cm up the side and heat to about 180˚C. Add the meatballs in batches, taking care not to crowd the pan, and cook until browned on all sides and cooked through (3-5 minutes per batch). Remove the balls and drain the oil into a heat-proof container, wipe the pan with kitchen paper and return to the heat and add the sauce on high heat until smooth and thick (2-3 minutes). Add the balls and coat with the sauce. 4. Spoon meatballs onto a large plate and sprinkle with coriander.